1300 Inflate offers a range of Inflatable Buildings intended to create comfortable temporary spaces in an economical, eco friendly and sustainable manner. The design of the Inflatable Temporary Buildings brings light and air into the interior to maintain a healthy, safe, flexible and workable environment. The buildings include well engineered and versatile fixings, quiet and low energy blowers, and clever interior extras. Optional with any structure are space attenuators and partitions, light hangers for fluorescent and LED lighting, cable ducts for power and computers, ventilation ports and many other innovative and flexible utilities. There are two main types of temporary inflatable buildings, namely Air Supported Structures and Inflatable Double Skin or Co-linear Cell Inflatable Structures. 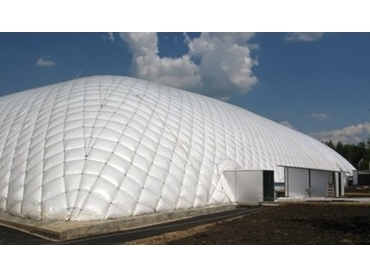 Air Supported Structures (also called Air Domes) are commonly used as inflatable temporary buildings when there is the need to create large covered and environmentally controlled spaces with clear spans such as warehouses, sports centres and covers for playing fields and tennis courts, agricultural purposes including greenhouses, as well as inflatable covers for swimming pools. The technology behind Inflatable Double Skin or Co-linear Cell Inflatable Structures is ideal for architectural creativity where forms can readily conform to functional needs. This usually results in uses such as inflatable portable museums and exhibition spaces, and highly branded inflatable site offices. These buildings also offer an inherent economy in manufacture, as well as a high level of portability and energy saving insulating properties. Their versatility in construction materials and the possibility of various auxiliary fittings makes this form of inflatable building an ideal form for uses in emergency response services, police and the military as well as any other mobile quick response operations.